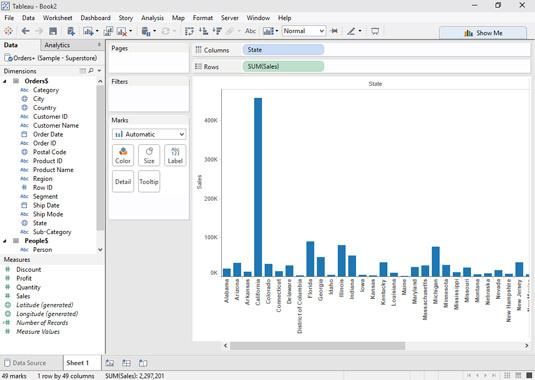 Tableau offers many different types of charts for your data. If you’ve done a bit of data analysis, you no doubt realize that different types of questions are best visualized using different types of charts. Simple bar charts may be familiar, but they don’t suit every analytical need and could lack in visual impact. For example, imagine if you wanted to show sales results broken down by state. A typical bar chart like this one arranges the states in alphabetical order, but it’s a bit hard to visualize how the results compare geographically. A typical bar chart arranged with states in alphabetical order. 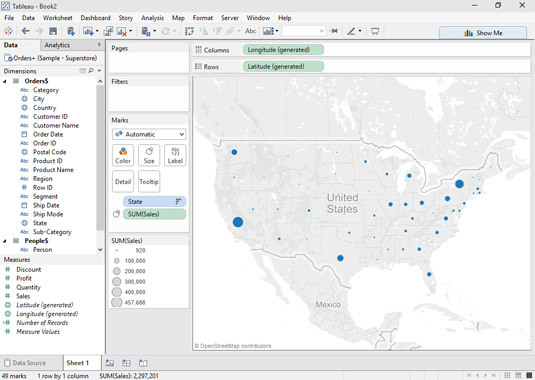 Tableau can also sort the chart so that the states appear sorted by sales, but it’s still hard to actually visualize how these results compare geographically. Sorting by sales helps, but the results are still difficult to visualize. To make the results easier to visualize geographically, you might want to try the Symbol map. With sales depicted as differently sized circles, it’s easy to see where most of the company’s sales are happening. A Symbol map is the perfect view for showing sales geographically. Popular chart types displayed in the Show Me palette. Show Me includes some popular chart types, and it lets you know which ones you can use by graying out types that don’t fit the current data in the view or selected in the Data pane. While Show Me gives you lots of great ideas, it is also helpful to understand some basics of visual best practices. 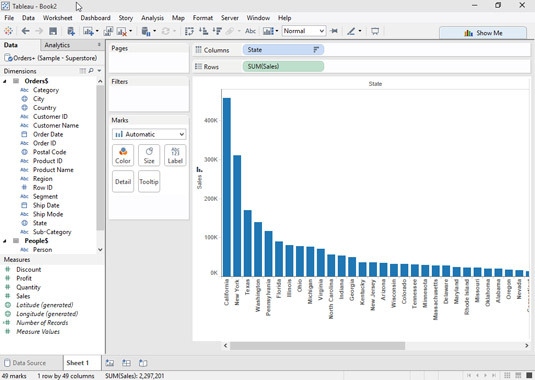 Search the web for “Tableau Visual Analysis Best Practices: A Guidebook” and you can download a white-paper with lots of great additional information to help you chose the best chart type.